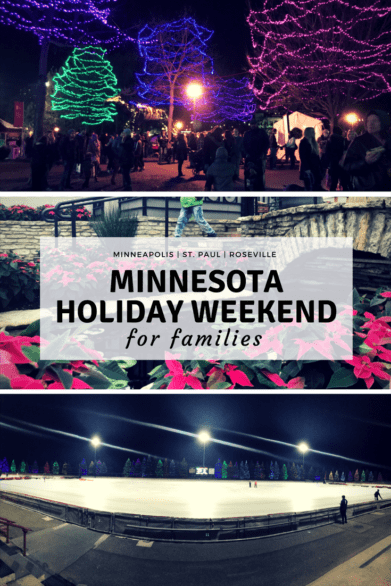 I planned a long weekend getaway to Minnesota for my family in December, timing the trip to enjoy holiday festivities in the Roseville and Twin Cities while we were there. Lucky for us, the weather was mild, so we spent some time outdoors. 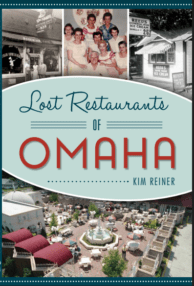 Our home base was in Roseville, Minn., a city perfectly situated between the attractions we wanted to see there and in the Twin Cities. Our stay was hosted by Visit Roseville, so we stayed at the Residence Inn Minneapolis St. Paul/Roseville. There’s free parking, free hot breakfast, large two-bedroom suites for families, and top selling point to my kids, an indoor pool. 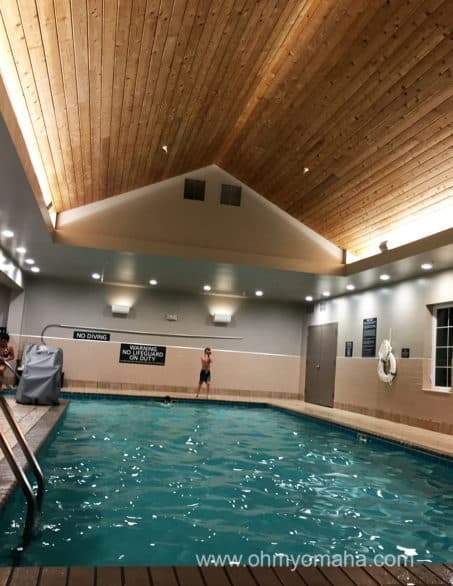 We managed multiple trips to the pool at Residence Inn during our busy holiday weekend in Roseville and the Twin Cities. Our hotel’s location conveniently located to get to everywhere we planned to visit in Roseville, Minneapolis and St. Paul. Read a review of our stay in the coming weeks. I love visiting Midwest cities during the holidays, and this trip to Minnesota didn’t disappoint. Rooms of the American Swedish Institute were decorated in holiday themes from various countries. 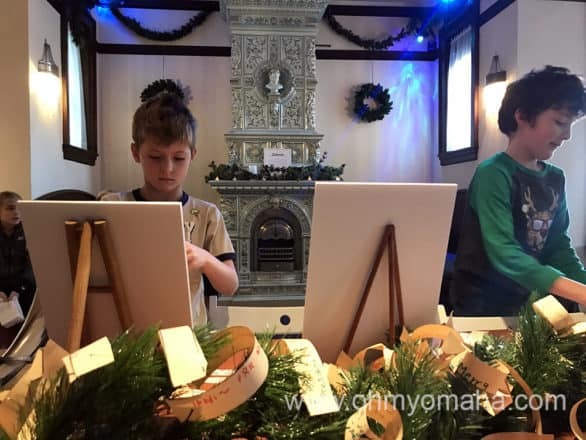 During the holiday festival, there were kids activities and live performances throughout the mansion (or caste, as my kids called it). For indoor festivities, visit the American Swedish Institute, which is gorgeously decorated for the holidays. Our visit, the first weekend in December, timed well, so we got to enjoy Julmarknad, a holiday festival featuring live music, kids activities, demonstrations, shopping, and yummy food and drink. I couldn’t resist trying glögg and kringla. 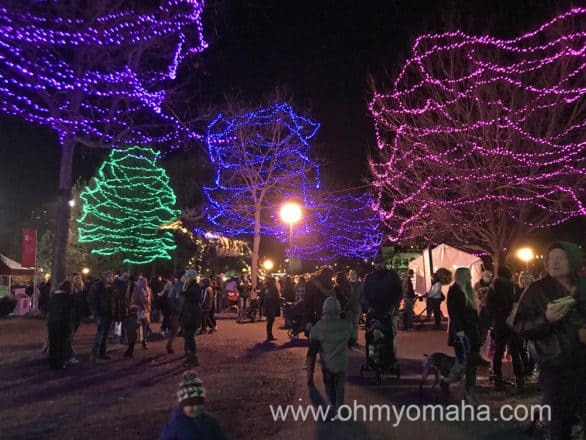 The festival is only one weekend a year, but you can visit during the holidays to see the decorations. Be sure to walk the grounds of ASI, too. The mansion is gorgeous. In 2018, the Julmarknad will be held Dec. 1 and 2. Loring Park in downtown Minneapolis is decked for Holidazzle, a free festival that runs through Dec. 23, 2017. Downtown Minnesapolis is home to Holidazzle, which runs Nov. 23 through Dec. 23 each year. 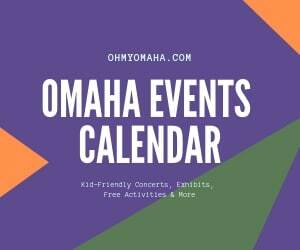 This FREE outdoor event has different activities like concerts, movies, and on the night we visited, fireworks. There are two huge animal sculptures made out of recycled materials that kids can help move. Those scared younger kids. The kids absolutely loved the kids play area, full of hay mountains to climb, a mini climbing station, a pipe rolling thing. We didn’t get to ice skate there, but that’s another activity. Since the weather was warmer than usual, the place was really packed. 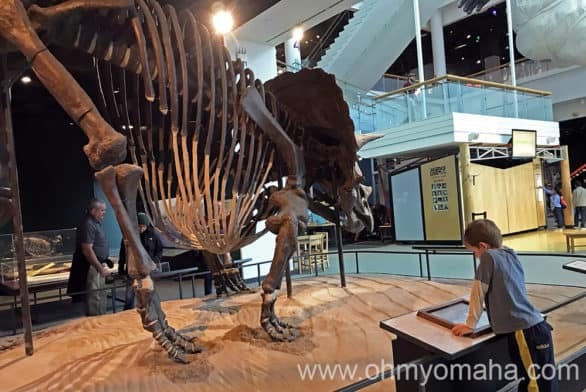 There are four floors of exhibits, including one of dinosaurs and fossils that include this guy – one of only four real Triceratops on display in the world and the largest complete specimen on display. Depending on the weather, you may spend a lot of time indoors. One of the biggest hits with the kids was the Science Museum of Minnesota. We could have easily spent 4 to 5 hours here, but managed to keep it around 3 hours, zooming from exhibits about the body, mazes, dinosaurs, sports, engineering. Netflix heads up: Science Museum of Minnesota is the museum with the “Stranger Things” shirt. Artist-designed courses make Can Can Wonderland an intriguing place to visit. One of the more unique attractions we visited was Can Can Wonderland, a whimsical mini golf center featuring 18 holes designed by artists, architects, electrical engineers and others. It was challenging and entertaining. There was about an hour wait to play, plus tack on another hour or so to putt. 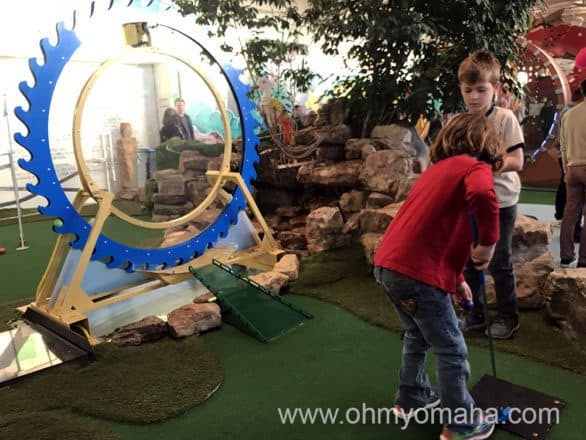 If your kids are young and struggle with putting, you might want to wait to visit because it can be an expensive. 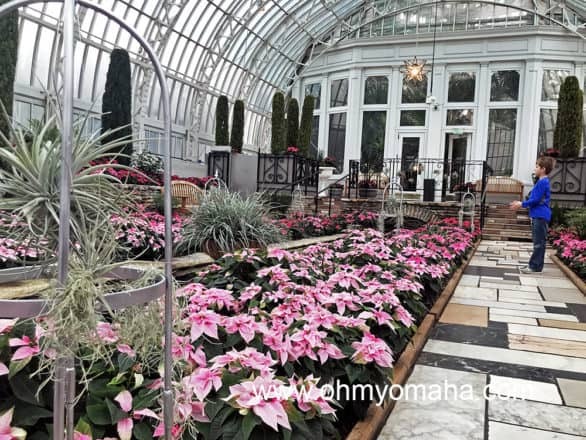 The Holiday Flower Show is free to visit inside the Marjorie McNeely Conservatory. We made a quick stop at Como Park to tour the Marjorie McNeely Conservatory in St. Paul. This was one of the few FREE things we did during our trip. The Holiday Flower Show full of poinsettias was all of our favorite to see, though the tropical plants and pond were a close second. The conservatory is next to a FREE zoo, the Como Park Zoo. It’s small, and in the winter, there isn’t a lot to see outdoors. However, kids can’t resist a zoo, so we walked through the primate house, and enjoyed watching the very active animals. Our original plan was to visit the Oval Skating Park in Roseville for a spin, but the timing didn’t work out due to a speed skating tournament. However, we stopped by to see OVALumination at night, and caught the end of the races. Lastly, we made a quick stop at the Rosedale Center to do a little Christmas shopping, but ended up letting the kids build a new friend at Build-A-Bear. 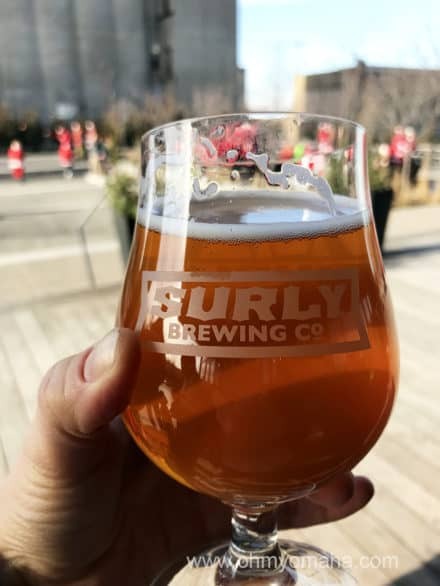 Surly Brewing Co. was a surprisingly family-friendly beer hall and brewery to visit for lunch. The kids played outdoors while the adults enjoyed one of more than two-dozen beers on tap. We visited while a bunch of festively-dressed cyclists were there. We had several great (totally-not-good-for-you meals) during our visit. Our favorite was at Surly Brewery Co., which was incredibly family-friendly. The kids enjoyed playing outdoors while we waited for our food. There were 35 beers on tap, and the food was memorable. If you’re adventurous, try to hog frites. 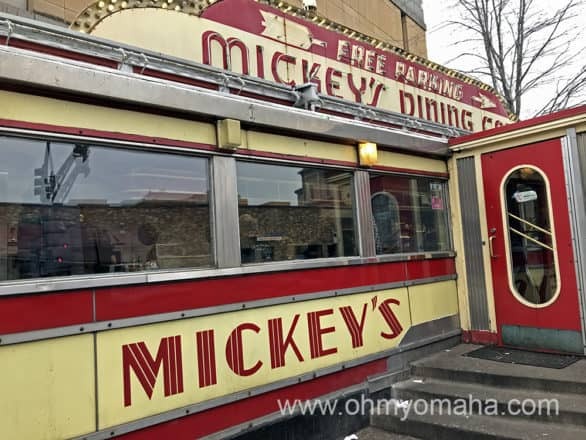 Our favorite breakfast was at Mickey’s Diner in downtown St. Paul. The omelet was, hands-down, the best we’ve ever had. For breakfast, we tried Keys Bakery & Café, a family-owned restaurant with several locations in the area, as well as Mickey’s Diner. Mickey’s is an institution, having been featured on several TV shows, magazines, and miniaturized as a collectible. My husband’s omelet was the best we’ve ever had with the fluffiest eggs ever. Service is quick and food was the best kind of greasy spoon. Tip: Mickey’s is a small diner and I wouldn’t recommend bringing a large family here, nor any kids who need high chairs. For lunch & dinner recommendations, try Lucky’s 13 Pub in Roseville. This large restaurant was another great family-friendly spot, and the kids were particularly happy with the popcorn served while you wait. We also couldn’t resist trying the cheese-stuffed burger this area is known for, the juicy lucy. We went to The Nook in St. Paul at a friend’s suggestion. It’s a hole in the wall bar with some pretty delicious food. The exterior doesn’t look kid-friendly, but it is. There’s a kids menu, and on Sunday evenings, kids eat free. These delicious truffles are worth the stop in Owatonna, Minn.
We were driving from the south, so we had to stop for lunch before we made it to our first destination. 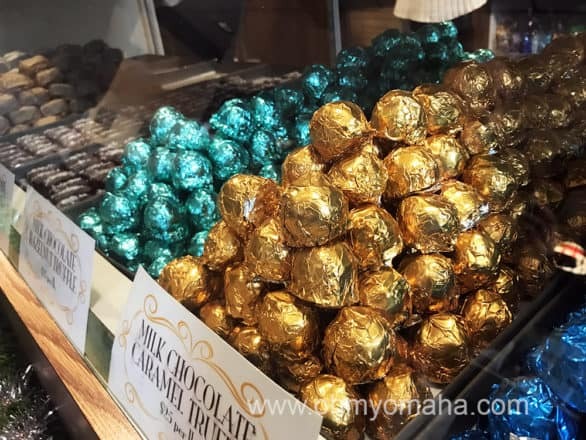 If you’re driving north on I-35, I recommend making a pit stop in Owatonna, Minn., for the delicious chocolate truffles at Costas Candies & Restaurant. It’s a busy week-day lunch spot, we discovered. I also have a plan to go there to enjoy some time with buddies in this weekend. I am so happy for it. I hope so that it will be a really great time for us and we will come back with great memories.